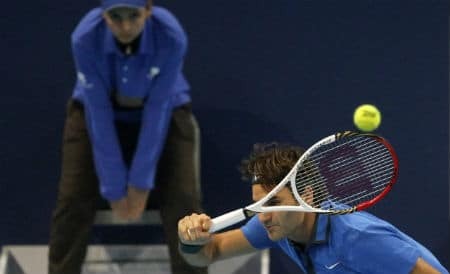 We're underway in Basel and Roger got off to a winning start beating Benjamin Becker 7-5 6-3 in the night match at the St. Jakobshalle stadium. The scoreline looks straightforward enough but contrary to what I said in my prediction it was a rather tricky affair and had Becker kept his head when it counted then he could have taken a set. Into the match itself and Roger held his opening service game comfortably enough, then immediately had 2 break point chances on the Becker serve; a couple of good serves from the German meant Fed couldn't capitalise and he held. It felt like quite a promising start. After that though the first set wasn't really much to write home about, Roger had 0-30 at 2-2 but hit 3 unforced errors in a row to blow his chance. He faced a BP on his own serve at 3-3 but saved it with a serve/forehand combo but disappointingly he just didn't seem to find any rhythm. At 6-5 Roger rather luckily got the breakthrough when Becker served a double fault on break point. It was a bit of a choke really and I felt like the set almost deserved to result in a tie breaker. I guess that sums up why Becker is down at 80 in the world though, he'd played pretty well, had a chance to break and then folded at the business end of the set. I thought after getting lucky to win the first set Roger would be able to free up and just play smooth tennis but that didn't happen unfortunately. He still wasn't finding his spots on serve and was making too many errors from the back of the court. The service game in which he was broken in at 2-2 probably sums up the match; a bit lackluster. It wasn't like Becker had to go above and beyond to break, he just had to get the ball back and wait for the error and that's never fun to watch. On a positive note however it wasn't as if Roger buckled after dropping serve; he hit straight back, held, then broke again before serving it out to love. That was a strong response and even though Fed looked visibly displeased with his game through the match it was nice to see him hit back when he needed to. In terms of the match stats Fed made 56% of first serves, converted 3 of 12 break points and won 82% of points behind his first serve. Not the worst stats of course but the first serve % needs to be higher because the more cheap points he's able to get the freer he can play. Has Roger's Poor Form From Shanghai Continued into Basel? I tweeted during the match that I was surprised that it looks like Roger's poor form from Shanghai has followed him into Basel. A lot of fans said I was being too picky and too harsh on Fed in his first match but I am concerned he is still feeling the effects of a long year and may not have enough in the tank to take down Basel and the World Tour Finals. I could of course be wrong and maybe he's just feeling a little rusty, he started in similar fashion last year against Starace and even dropped a set to Nieminen before sweeping to the title so it's not like this hasn't happened before. The one difference I see this year though is Roger isn't serving well and is handing out breaks for fun, in those two matches I've highlighted above, he wasn't playing great but he was still serving superbly well. Lately his first serve has been way off the mark, Murray took it to pieces for large parts of the Shanghai semi final and today against Becker it wasn't exactly firing on all cylinders. He still hit 10 aces but 56% of first serves isn't the greatest stat and I think this has to improve. One good thing though is he isn't going to come up against any world class returners so it's not like he's going to get really pressured into making first serves. Maybe that can play to his advantage and give him some confidence because I think he looks pretty low right now. It's still early in the tournament though so it's a little too early to judge Roger completely so we'll just have to see how his next match goes against Thomaz Bellucci or Go Seoda. Then we'll know for certain if his form has returned. Those 2 player tomorrow evening and I'll update this post with a prediction. I agree, not too impressive but he’s through. I still think he’ll win Basel but he should skip Bercy! Should look better against his next opponent though! I think he will have to up his level to win Basel. Del Potro is a threat. Even Stanford Wawrinka could do some damage if he hits the backhand well. ^Marijan, yes Roger will lose the No.1 ranking after Paris, it is already stated on the ATP website that the points for Basel, Paris and London in 2011 will drop off on 5th November, which means that Djokovic will regain No.1 no matter what happens. However there is a chance for Roger to retake it right after London, but it depends if he can defend his titles and if Djokovic does poorly in Paris and London. Yeah it’s because the season is 2 weeks shorter this year. Still, that won’t stop these ATP bozos from playing God when it comes to the juggling with points. I agree Jonathan. Federer geared himself up with goals in mind. He played so many matches, gained points, got to #1, won an Olympic medal, got his 17 grand slam. It’s only human to have a come down from this huge push. If we look at it, Djokovic is the same, he has been playing sub par, seemed to have lost his rhythm, and now he is finding his come back to that. It’s only human is it not. No one can sustain that fire all the time. Federer is amazing in the fact that he has held that fire for so long. I read an article by sanibel chai and he had a line which summed it up for me, here it is “Very few players now, and in the history of tennis, would be capable of playing below peak and still hold the No. 1 ranking”. Part of it is also psychological warfare. Players, subconsciously are aware of when their adversaries “up” their level. Often times, they will back down during such periods, conserve and wait to make a timely push. It’s just like the ebbs and flows you notice during a single match. Djokovic will be ready for the next 6 months. Nadal is “resting” and will breathing clay when he is back next year. I suspect Roger will take it easy until the end of the clay season. Murray of course will be back to giving his anatomy lessons. What an incredibly nasty thing to say! Have you heard of Karma? Think about it…..
Yeah I’m not wishing an injury merely stating I think one is inevitable. I’ve predicted it for the last few seasons because Murray isn’t a natural athlete, just a product of the gym. Those bodies tend to break down. Which is what I think happens in 2013. Cool quote, hadn’t seen that but agreed with it! Fed should rest for 2013 now. Should be a rating system. Like in chess. If you beat some-one you weren’t supposed to beat, your rating goes up. If you lose to some-one you weren’t supposed to lose to, your rating goes down. That way, it only matters who you beat, and who you lose to, not what round you reached in a given tournament. Solves the problem of a tournament won 51 weeks ago being considered useful in determining how good a player is now, but a tournament won 53 weeks ago being completely irrelevant, as player ratings would gradually change over time, and no results would ever really ‘drop off’, but rather just become insignificant as much more recent matches change a player’s rating. This would also stop a semi-final showing in a tournament in which you only had to beat players ranked 20+ who beat a player in the top 4 to get there from being worth the same as a semifinal showing where you had to beat both del potro and djokovic, for example. Interesting take! That could actually work though. They use ELO in a few American sports I think and it works. But would the they ever introduce such a big change? Nadal would want a 3 year ranking system if they talked about that. Just checked out your blog that you started, looking forward to more posts. If you ever want to have a guest post on here just let me know. While that would be the most optimum system it would still have to factor in a lot of things like, how much a player participates, extra weight for winning tournaments etc., or a player “opting” out of a tournament because they wouldn’t lose tournament points they earned last time. Look, there is a reason chess uses a different ranking system: they are very different sports. I’m sure when you delve deep into it, you will find a lot of problems with that approach. Such a system, I believe would give less incentive to participating and/or winning tournaments compared to just winning matches. Tying big tournament wins to big swings in the points count, and hence ranking, in my opinion, makes the game more interesting. Imagine, a Nadal win at Wimby 2008 would’ve given him some points but not the No. 1 ranking (because you now have to account for how “close” the loss was and that only the No.1 and No.2 ranks separated them). With so little at stake, would that match have been considered the greatest ever? I think not. In my opinion, the current system works well but needs to be addressed for a few issues.